The JOY of a wedding! We have a wedding coming this summer! I get to be the DIY wedding decorator and I am so excited. My daughter has chosen her colors and now I get to put my hand to the task of creating table decorations and more! We have lots to do and this is just the beginning...you'll see more of my wedding projects next month! To make one of the flowers, cut the teal cardstock (12"x12") into nine equal squares. Cut off the four corners of one square making it round - it doesn't have to be perfect. Cut it into a spiral shape, about 3/8" thick. Leave a little circle in the middle. Roll the spiral into the form of a rose. Adhere the circle on the bottom to the rest of the flower to secure. A glue gun works best for this step, especially if you have multiple flowers to secure. I use my fingers and thumbnail to distress the edges of the rose. Repeat for each flower. 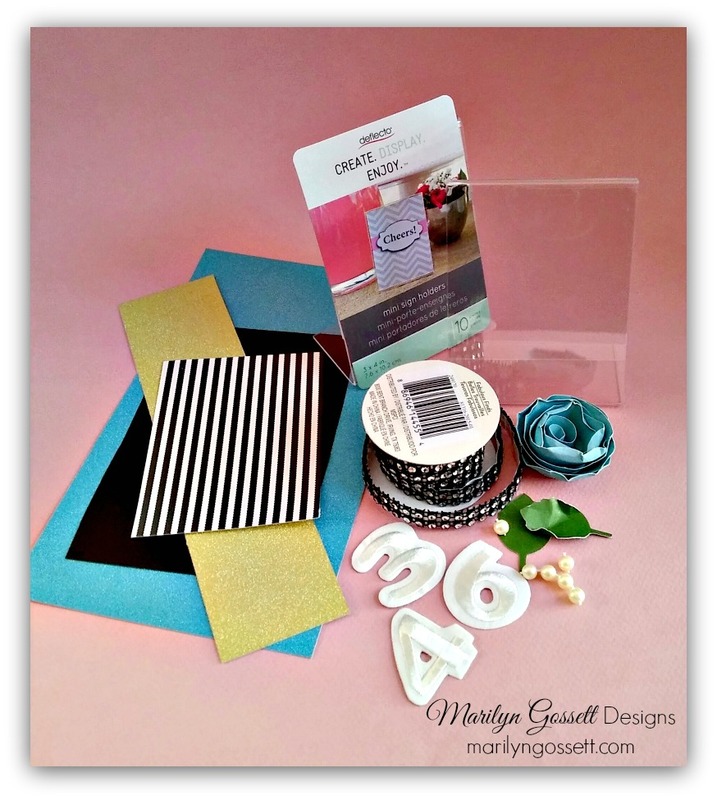 Cut smaller squares of cardstock for smaller roses. Cut out leaves by hand or with a die-cutting machine. If you cut out a heart and cut it in two; you can more easily shape each half into a leaf. Add the leaves after gluing the flowers to the frame. Center and adhere the gold paper to the slightly larger black paper. Center and adhere to the background paper 1/2" up from the bottom edge. Insert into the frame. Embellish the outside of the frame with the faux rhinestone trim, flowers and leaves. Glue one pearl into the center of each rose. Remove the backing from each number; center and adhere to each frame as shown in the photo given. Did you know that you do not have to limit yourself to only ironing-on JOY letters to fabric? You can put your name or initials on everything you own - if the surface won't take the heat of an iron, just use a bit a glue. I used a letter "R" to monogram my cell phone case, and I added my name to my new day planner for 2016 and I initialed the cover of my journal. 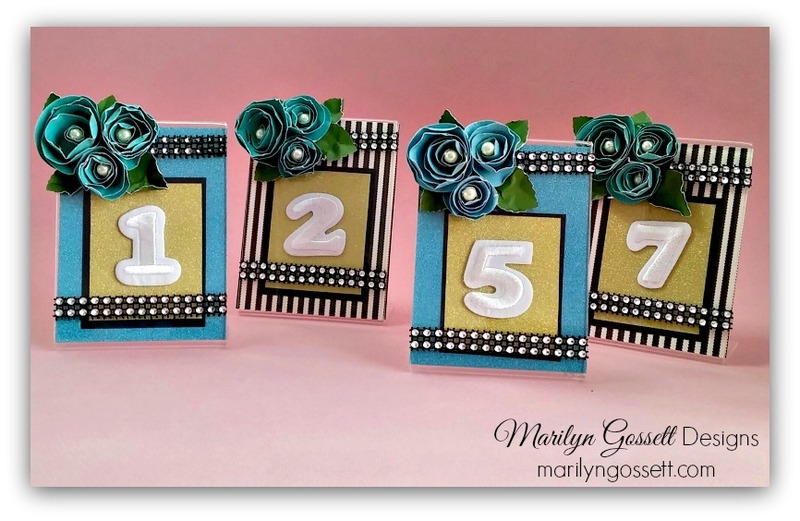 Look for Joy letters and numbers at your favorite craft store - happy crafting! I hate throwing anything away that might possibly be used on a project later. But…in an effort to make a little room and not become a hoarder, I actually threw these little scraps of fabric away. It was hard, I love these prints! 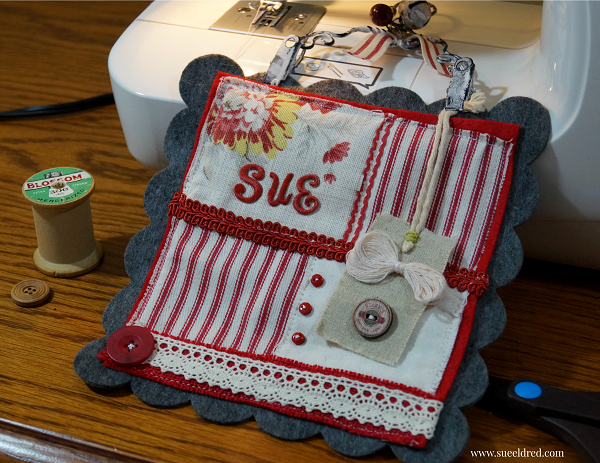 Only minutes later, while I was making a permanent home for my new sewing machine that I got for Christmas, I got the idea to make a stitched sampler. What a great use for little pieces of fabric. Now, bear in mind that this is my first real project on my new machine. I misted the iron-on embroidered letters from Joy SA and the white decorative trim with Tattered Angels Ruby Slipper Chalkboard Mist Paint and stitched to my heart's desire. I cut a large die-cut square out of premium gray felt using my Accu-cut machine. I’m pretty pleased with the way it turned out. With the addition of a granddaughter to our family, I am getting to make all kinds of cute crafts these days. Last year she was really too young to enjoy Easter, but this year she will be 18 months so the Easter Bunny will be making an appearance! 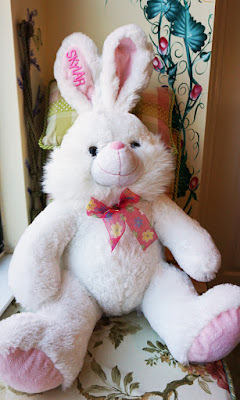 For this project, I upcycled a bunny from the huge supply of stuffed animals that my daughters still have here at my house. It was super easy to add a custom touch to this little guy with Joy iron-on letters. I just ironed the letters on to his ear following the easy directions found here. What do you have in your home that could use a personal touch? 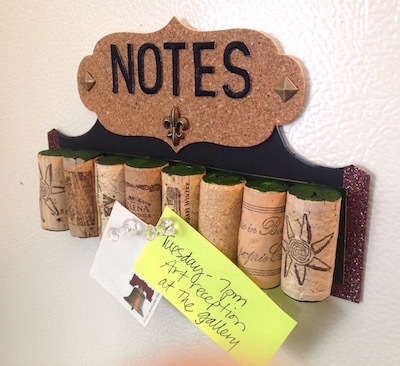 Since I made this mini wine cork bulletin board, I must confess...I do enjoy drinking wine and I save all my wine corks. And yet another confession...in spite of so many handy apps and online calendars, I still use my refrigerator for filing and reminders. I needed to designate a small space on the side for the more important items to stand out from all the rest, so this is what I came up with. 1. If desired, dab the ends of the corks in paint to color and set aside to dry. 2. 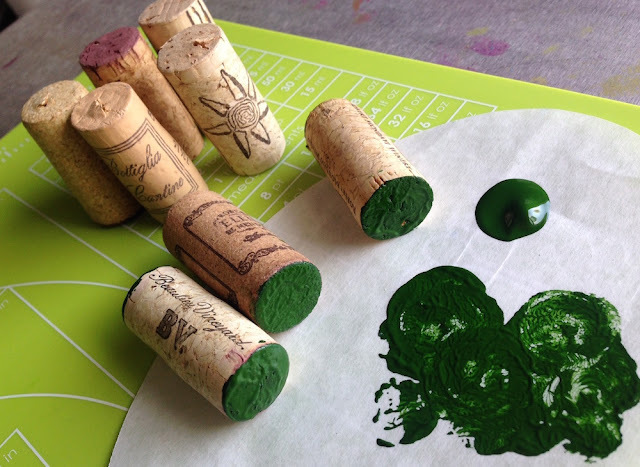 Glue the corks side by side to a strip of sturdy cardstock. Place a heavy book on top while the glue dries. 3. Cut a header card from sturdy cardstock and glue a die-cut cork placard at the top. Trim the edges with glitter tape. 4. 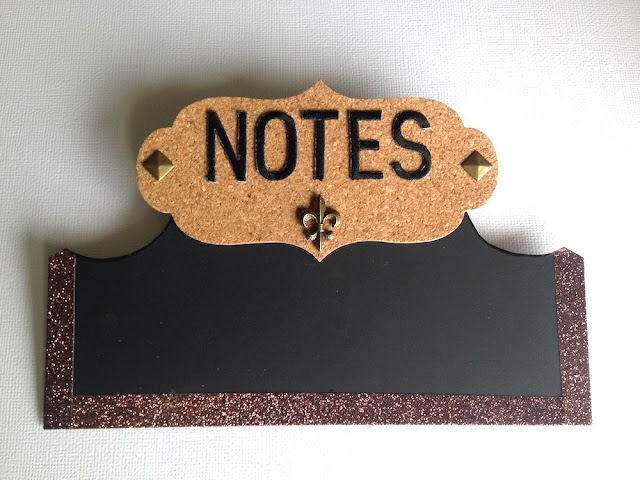 Glue the Joy letters on the cork die-cut to spell "notes" or "memo" or your name. Embellish with metal charms as desired. 5. 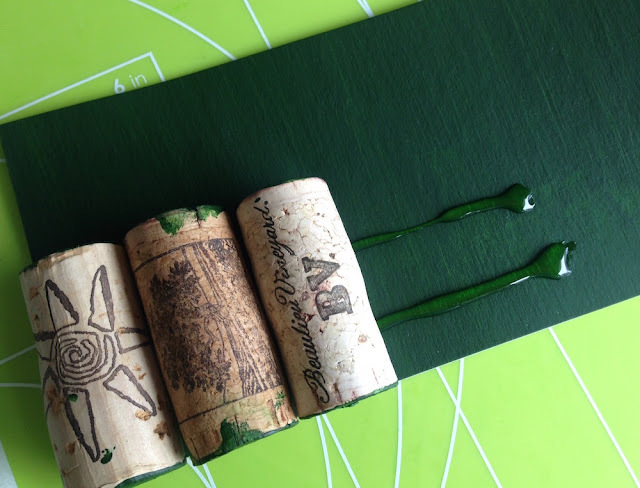 Trim and glue the strip of wine corks to the header card and place a heavy book on top while the glue dries. 6. 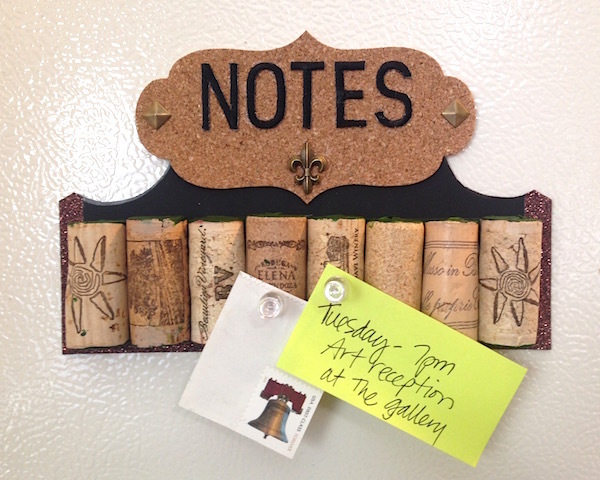 Trim and adhere a magnet sheet to cover most of the back of your mini wine cork bulletin board. Happy Valentine's Day! 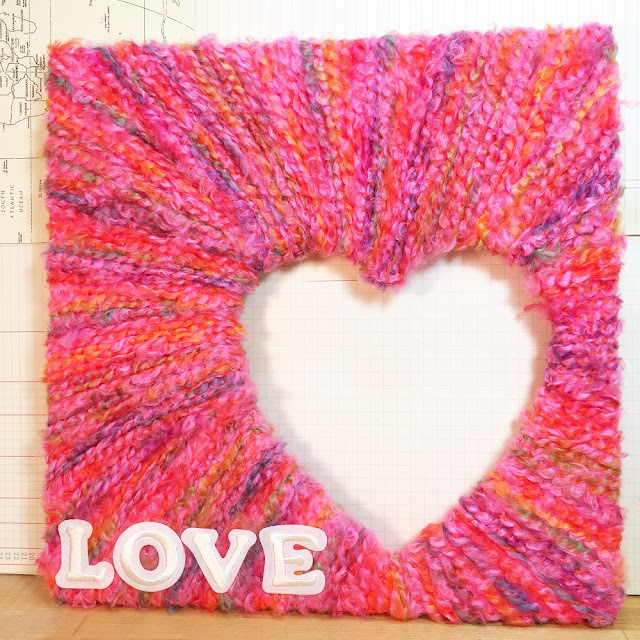 We love this yarn-wrapped frame with an open heart cut-out, designed by Beth Watson. 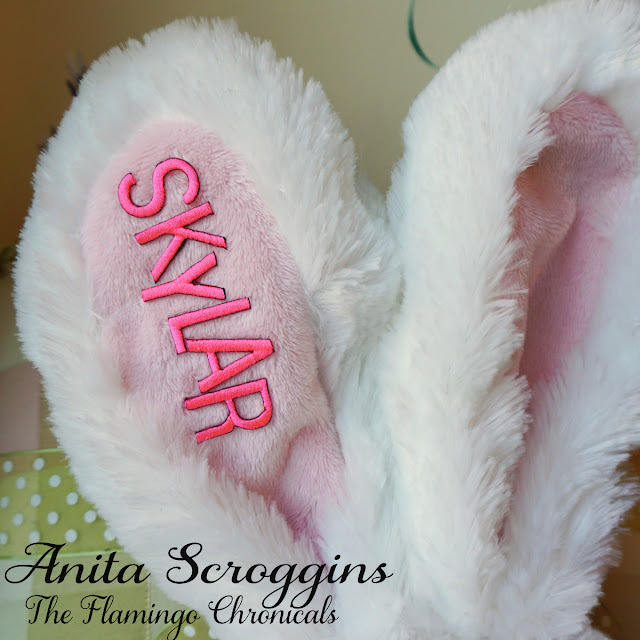 The softness of the embroidered letters works nicely with the fuzzy pink variegated yarn - click here for the full tutorial on the Smoothfoam blog. 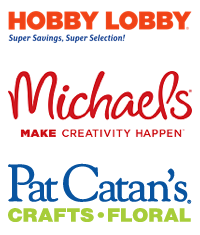 Look for Joy letters in your favorite craft store! Having three cats means that I have a lot of cat accessories! Leashes, medications, toys, and treats usually just collect in a basket. So I decided to get my babies' stuff organized, but in a cute way. I decorated the top and sides of a 4-drawer acrylic cube with patterned paper and washi tape. 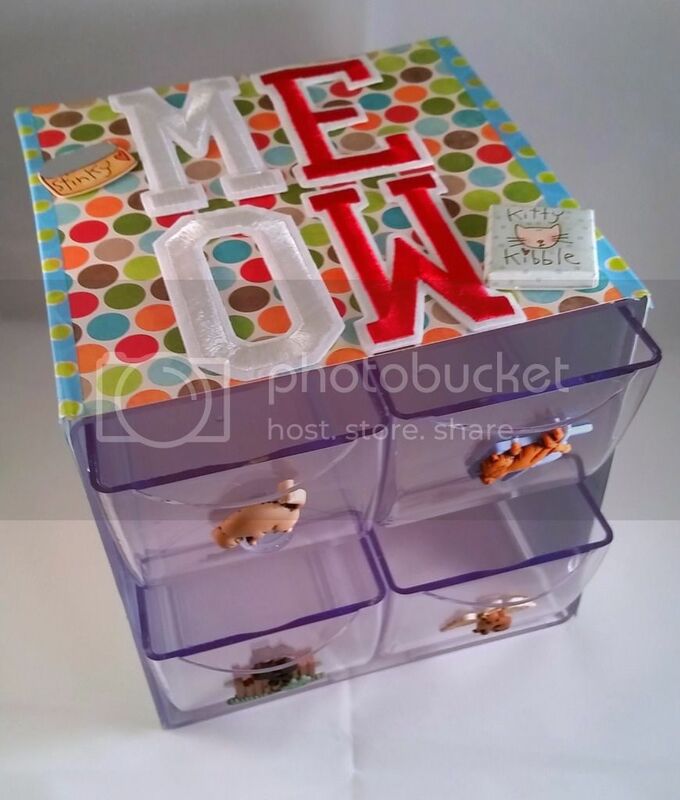 I then added JOY stick-on letters spelling out "meow" and finished it off with some dimensional cat-themed stickers. Quick and easy! Now my kitties' accessories can be stored in style! I love all things monogrammed and these key fobs can really be used for anything. The are great for keys of course, but also backpacks, purses, zipper pulls, even as gift tags. They are really quick and easy to make too! JOY Embroidered letters and numbers. 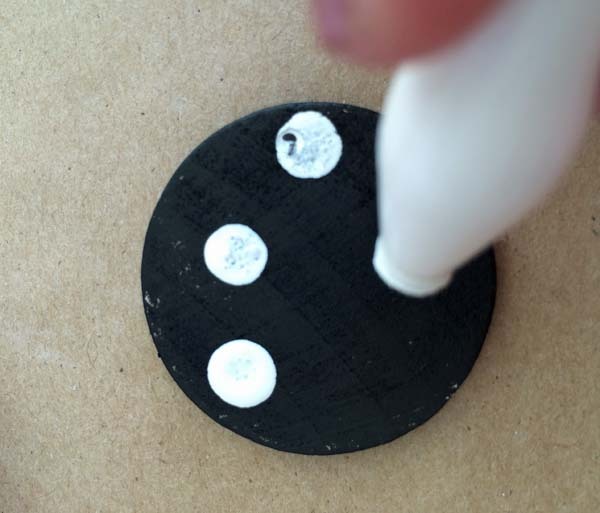 Small wood pre-drilled round tags. 1. Paint the wood disc in the color of your choice. Allow to dry completely. 2. Add polka dots in a contrasting color with a sponge dauber. 3. Glue a JOY letter on the disc. 4. 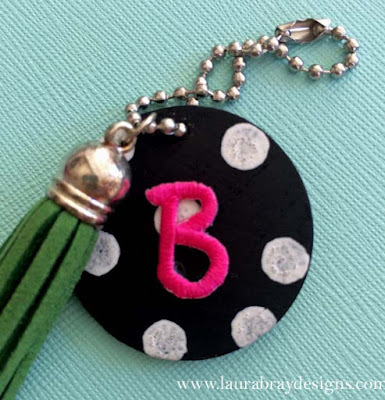 String the keychain through the hole and add any additional embellishments. Look for Joy at your local craft store! If you're like me, your craft room is always in need of a little organization. 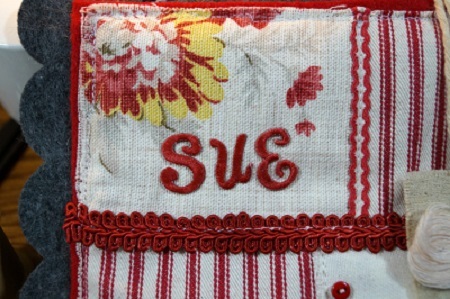 Joy embroidered letters are perfect for labeling your storage containers to help you organize and find your supplies when you need them. I favor plastic bins on open shelving because I like to see what I have. When I'm looking across the room from my desk, I need the label on each bin to be readable, so I used 1-1/2" letters. These have a semi-permanent adhesive backing, so I just stuck them on my plastic bins - quick and easy! 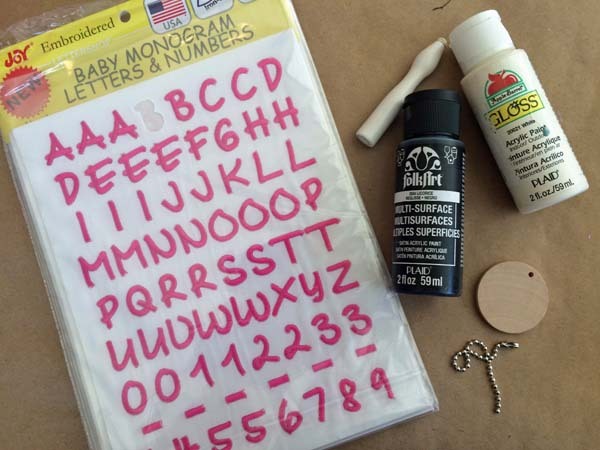 But if you have a different type of storage, like canvas totes or plastic crates, Joy letters will work well for labeling those by ironing or gluing the letters on. Joy letters come in a variety of sizes for labeling smaller containers or drawers, and with lots of colors and fonts, it's easy to find something to suit your style. Look for Joy at your favorite craft store! 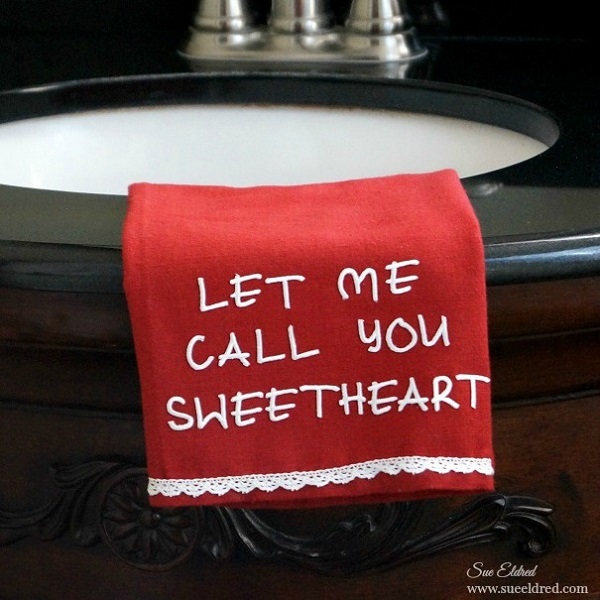 Show your sweetheart how much you love them this Valentine's Day with a cute embellished hand towel. It's easy! 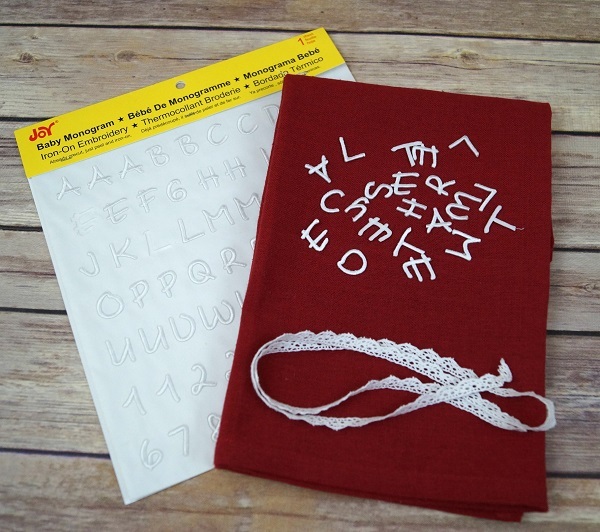 Use mini Joy embroidered letters to iron-on your message and then sew on a simple lace trim. A perfect way to let them how much they're loved.